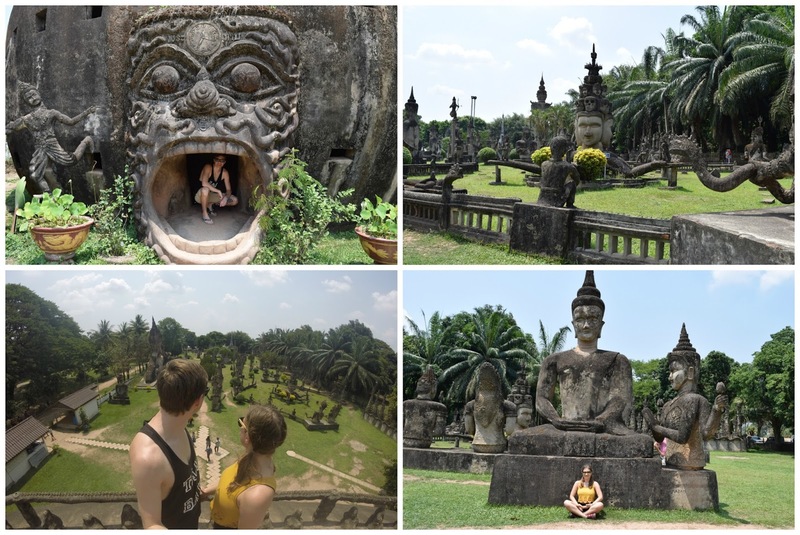 Is it worth visiting Vientiane? Lots of people visit Laos on the popular Thailand - Laos - Cambodia - Vietnam route but most opt to visit Luang Prabang over the capital of Laos: Vientiane. Two slightly misleading things though: firstly this is not a temple (it's a park), and secondly though they might look it, the statues aren't hundreds and thousands of years old. The park was actually set up in 1958 by a priest-shaman who integrated Buddhism and Hinduism (hence why there are both Buddhist and Hindu statues). The statues are from around this time too and are made from concrete. A final slightly misleading thing is this park isn't really in Vientiane - it's a 30 minute drive away and is on the border with Thailand. Most hostels and hotels will try and sell you day trips there - don't do it! It's the easiest thing in the world to take the bus there by yourself and costs a fraction of the price (plus you get to bus-people watch)! Find out more: how to get to the Buddha Park Vientiane. Night markets are a must for anyone and everyone visiting South East Asia - they're at night (duh) which makes the temperatures bearable and you can find some pretty cool/unusual things there. Nevertheless, there's a general census that once you've been to one night market, you've been to them all. However, we found the Vientiane night markets to be slightly different. Mainly because there was nothing really suitable for us to buy there (not that that stopped us). Most people are selling clothes - super thick clothes that un-climatised Westerners like us just can't wear. The upside of this (and another unusual thing about the Vientiane Night Markets) is that there are barely any tourists there at all - which is great: so don't go for the shopping, go to people watch. We really enjoyed the food in Vientiane from the nice cream by the river to the yummy local restaurants. We tried Reunion Cafe and liked it so much we went back every day (we recommend the vegan chicken strips). We fell in love with pretty much every Laotian that we met, they were quick to laugh with (at) us and very sweet in general. Vientiane doesn't see too many tourists which is great as a) you don't have to put up with tonnes of annoying tourists and b) the locals are still kind and curious with foreigners - as opposed to fed up and annoyed which you sadly (though understandably) see a lot in South East Asia. The Crowne Plaza was the perfect base for our trip to Vientiane: they serve an excellent breakfast in the morning (with quite possibly the most extensive range of foods we've ever seen at breakfast, from local Laos noodles all the way to baked beans and hash browns). This sets you up for a great day of sight seeing. The official currency in Laos is Lao kip. But you can also use US dollars and Thai Baht. Where these two are accepted varies a bit, and they will almost always give you change in Lao kip (sometimes dollars, but mainly Lao Kip). We used Thai Baht on the bus and in a tuk tuk. We used US dollars at the night market, in a convenient store and at a restaurant. One restaurant we went to only accepted Lao Kip. Basically take Lao Kip or take it out when you get there, but if you only want to use US dollars or Thai Baht it won't be the end of the world. Once you're through you can catch the 6000 kip bus into Vientiane (it's the number 14, the same bus you'll take to the Buddha Park). It's the same kind of idea going backwards, stamp out of Laos, 20 baht bus over the bridge, stamp into Thailand. For those that don't want to take the bus/train and want to fly, we recommend Kiwi - the best flight comparison website ever - we love that site! Last but not least, Travel Insurance, did we need it in Laos? No. Were we glad we had it? Always. Don't leave your country without travel insurance, that's just silly.